Frank Scott Jr. has been elected mayor of Little Rock. 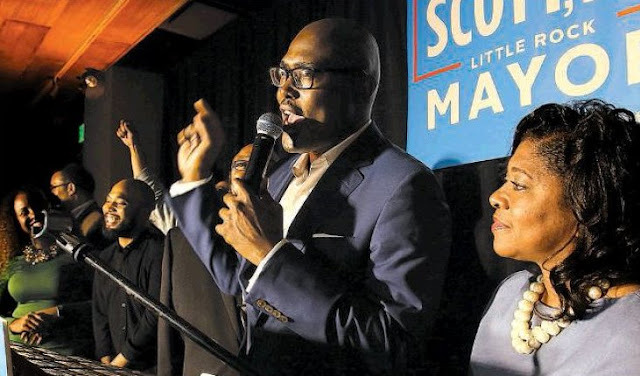 Scott is the first African-American elected mayor by popular vote in the city's history. Little Rock has had two black mayors, but they were city directors chosen for the job by fellow board members. He defeated Baker Kurrus in the nonpartisan runoff election Tuesday after the two received most votes of the five candidates in the general election Nov. 6. Kurrus conceded to Scott about 8:30 p.m. Tuesday after early voting and absentee ballot numbers showed Scott had a sizable lead. Scott succeeds Mayor Mark Stodola, who announced this year that he would not seek re-election after 12 years in office because of a family medical issue. Scott, a 35-year-old Little Rock native, is a banker and associate pastor. He was a deputy police director and director of intergovernmental affairs under former governor Mike Beebe. He has also served on the state highway commission and the board of directors for the Little Rock Port Authority and Big Brothers and Big Sisters of Central Arkansas. Scott is graduate of the University of Arkansas. He holds a master's degree in business administration from the University of Arkansas at Little Rock.